The world needs leaders. Leaders head families, coach teams, run businesses and mentor others. These leaders must not only accomplish, they must communicate. More than 2,000 members from 110 countries around the world arrived in Chicago to compete in speech contests, participate in the opening ceremonies, and listen to inspiring and motivation speakers. Stop by the AmpliVox booth #TICon2018 and hear how our portable sound systems and lecterns offer a style for every speaking need. U.S. Senator Bob Menendez joined by firefighters from across New Jersey to celebrate passage of the Firefighter Cancer Registry Act, during the news conference at Englewood Fire Dept. HQ in Englewood on 07/03/18. Fires present unique health risks to those who battle them — the flames produce fumes and debris that are known or suspected to cause cancer. And small particles from burning plastics, carpet or asbestos can worm their way into the lungs. Firefighters have a higher rate of both cancer deaths and cancer cases than the general population, a multi-year study by the National Institute of Occupational Health and Safety found in 2013. The increases were found in respiratory, oral, digestive and urinary cancers. Researchers were careful to note that the study could not identify which cancers were caused by the firefighters’ work and which were caused by personal risk factors, such as family history or smoking. The study doesn’t mean a healthy firefighter will get cancer. The AmpliVox Pinnacle Multimedia Lectern helps you look great, indoors or out. 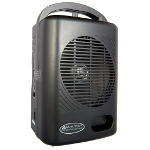 It is available with built in wireless PA with 150 amp (SW3250), connection to house PA (ST3250), or lectern only (SN3250). The lectern has a rugged, weather resistant plastic shell that comes in your choice of five front panel colors: Mahogany, Oak, Maple, Cherry or White. Roll this lightweight lectern anywhere using built-in handles and two tilt and roll casters. A tabletop surface securely holds your laptop or papers and there is a spacious storage shelf. The ST3250 model adds PA to the lectern with gooseneck mic sensitive up to 18" away and built-in AC power outlet and XLR audio to connect to house sound system. SW3250 adds a 16 channel wireless sound system with a 150 watt amplifier and two Jensen design speakers. Both the ST and SW models offer a complete dashboard with digital clock and timer, lectern light, and audio controls. The SW model provides a wireless receiver and Bluetooth connectivity. While Owens opted not to travel to Canton, and instead gave his speech at his alma mater earlier in the day, seven stood on the stage in front of a stadium of fans, family, and players. AmpliVox's long time hometown favorite Brian Urlacher from the Chicago Bears was elected on his first ballot in a deep class of finalists. His induction to the Pro Football Hall of Fame is a a well-deserved recognition of his career as one of the best middle linebackers to ever play the game. We can even add your logo. AmpliVox offers custom logo solutions to add your business logo prominently on any lectern of choice.